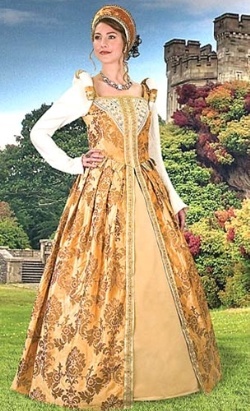 A gown for a true Elizabethan noblewoman! Crafted of rich, gold brocade (100% cotton) and lavish trim, the gown features period shoulder rolls and piccadills (tabs) at the waist. A lace up back allows for ease of fit. We recommend that this gown be worn with our period farthingale (hoop skirt). Available in your choice of small, medium, large, or extra large. Order a petticoat to accompany this in your choice of color (sold separately). Small 24" - 28" 30" - 34"
Medium 28" - 32" 34" - 38"
Large 32" - 36" 38" - 42"
X-Large 36" - 38" 42" - 44"